I have installed BT5 (which is completely awesome) on my netbook. As usually I don't have any other system there. Well... now when I boot, I don't have the option to go to GRUB (on BT4 I had to press "ESC" to get there) I need to go to GRUB to edit boot options, because I need to put "irqpoll" on the end or the system fails to boot. Can you help me please? And when I finally fix the GRUB thing, how can I save the "irqpoll" in the boot options so I won't have to put it there manually all the time? Secunia Security Advisory - Ubuntu has issued an update for exim4. This fixes a vulnerability, which potentially can be exploited by malicious people to compromise a vulnerable system. Secunia Security Advisory - Fedora has issued an update for seamonkey. This fixes multiple vulnerabilities, which can be exploited by malicious, local users to gain escalated privileges and by malicious people to disclose sensitive information and compromise a user's system. Secunia Security Advisory - Some weaknesses have been reported in the Linux Kernel, which can be exploited by malicious, local users to disclose certain system information. Secunia Security Advisory - A vulnerability has been reported in Apache HTTP Server, which can be exploited by malicious people to cause a DoS (Denial of Service). Secunia Security Advisory - A vulnerability has been reported in Apache APR, which can be exploited by malicious people to cause a DoS (Denial of Service). Secunia Security Advisory - Red Hat has issued an update for rdesktop. This fixes a vulnerability, which can be exploited by malicious people to compromise a user's system. Secunia Security Advisory - SUSE has issued an update for mono. This fixes a vulnerability, which can be exploited by malicious, local users to gain escalated privileges. BackTrack HowTo's are "Privat" ? i saw that some links form the Tutorial site are broken. Because they link to the BT4 Forum which is "Private" now?! Is there any reason ? Ok BT4 is no more supported but the tools are the same. Is there a way to get the access back to the HowTo? Default wireless chip all working fine. again). It eliminates many of the concerns of using ACLs over stateful. Code: svn: OPTIONS of 'https://metasploit.com/svn/framework3/trunk': Could not read status line: connection was closed by server (https://metasploit.com) I can update Metasploit on BT4 VM normally. What is the cause, and how to fix this issue? Cannot view bt4 forums once logged in. I do not know if it is just happening to me, or others too. I have clicked to the main forum to see if I can find my way back and the BT4 section is missing only after I have logged in. I have also cleared history, cookies, and restarted the browser, the same result occurs. I think wifite would be a good addition to bt5 for quick wep testing. also a menu for wireless like bt4 had with a list of all the wireless tools. Secunia Security Advisory - Red Hat has issued an update for apr. This fixes a vulnerability, which can be exploited by malicious people to cause a DoS (Denial of Service). Secunia Security Advisory - Core Security Technologies has reported a vulnerability in Sun GlassFish Enterprise Server, which can be exploited by malicious people to bypass certain security restrictions. Secunia Security Advisory - A vulnerability has been reported in Taxonomy Access Control Lite module for Drupal, which can be exploited by malicious users to conduct script insertion attacks. Secunia Security Advisory - A security issue has been reported in HP Network Node Manager i, which can be exploited by malicious, local users to disclose sensitive information and manipulate certain data. Secunia Security Advisory - Two vulnerabilities have been reported in PHProjekt, which can be exploited by malicious people to disclose sensitive information and conduct cross-site scripting attacks. Secunia Security Advisory - A vulnerability has been reported in NetBSD, which can be exploited by malicious people to cause a DoS (Denial of Service). Secunia Security Advisory - A vulnerability has been discovered in SlimPDF Reader, which can be exploited by malicious people to compromise a user's system. advantage of this vulnerability, hacker might execute malicious code or get cookie of CMS’s administrator. I finally got BT5 installed on my laptop (installed on HDD, single OS). I'm in the process of trying to get g0tmilk's fakeAP_pwn script working on BT5, tracking down new dirs where things are installed, etc. Anywhere from every 30 seconds to 5 minutes, the computer completely freezes. No response from anything. It's happened about 7 times so far and is frustrating as hell. Anybody else having this problem? XML Security Library is a C library based on LibXML2. It provides an implementation for major XML security standards: XML Digital Signature and XML Encryption. Chasys Media Player version 2.0 buffer overflow exploit that leverages SEH. Core Security Technologies Advisory - The Administration Console of Oracle GlassFish Server, which is listening by default on port 4848/TCP, is prone to an authentication bypass vulnerability. This vulnerability can be exploited by remote attackers to access sensitive data on the server without being authenticated, by making 'TRACE' requests against the Administration Console. Oracle GlassFish Server version 3.0.1 and Sun GlassFish Enterprise Server version 2.1.1 are affected. This is a brief write up discussing how to leverage cross site scripting and shell upload vulnerabilities in eyeOS versions prior to 1.9.0.3. ClubHACK Magazine Issue 16 - Topics covered include the Browser Exploitation Framework, New Rules Under The Information Technology Act, Forensics With Matriux Part 1, and more. Most security certifications are a mockery of entire industry. HP Security Bulletin HPSBMA02672 SSRT100485 - A potential vulnerability has been identified with HP Network Node Manager i (NNMi) for HP-UX, Linux, Solaris, and Windows. The vulnerability could be exploited by a local user to read and write data and log files. Revision 1 of this advisory. HP Security Bulletin HPSBMA02642 SSRT100415 2 - A potential vulnerability has been identified with HP Network Node Manager i (NNMi) for HP-UX, Linux, Solaris, and Windows running Java. The vulnerability could be remotely exploited to create a Denial of Service (DoS). Revision 2 of this advisory. I was about to start setting up Backtrack 5 on a usb, but when I plugged in my usb to my fresh install of Backtrack 5 on my laptop, my usb was automounted. My usb currently contains a copy of BT4r2 and working fine but it is automounting when I plug it into BT5. Does anyone know how to disable the automount feature in BT5? As a note I tried from a file browser to go to Edit->Preferences->Media-> then selecting 'Never Prompt or start programs on media insertion'. But no luck there. I was also looking at gconftool or gconftool-2 but couldn't find exactly what to change with this. Would like to know why only provide the download source as torrent and not like before from other direct download source? PRE-CERT Security Advisory - The Linux kernel contains a vulnerability that may lead to an information disclosure or a denial-of-service due to corrupted partition tables on storage devices. The kernel automatically evaluates partition tables of storage devices. The code for evaluating EFI GUID partition tables contains a buffer overflow bug that allows to leak data from the kernel heap to userspace or that may allow to cause a kernel oops resulting in a denial of service. Ubuntu Security Notice 1131-1 - Thomas Jarosch discovered that Postfix incorrectly handled authentication mechanisms other than PLAIN and LOGIN when the Cyrus SASL library is used. A remote attacker could use this to cause Postfix to crash, leading to a denial of service, or possibly execute arbitrary code as the postfix user. GGGooglescan is a Google scraper which performs automated searches and returns results of search queries in the form of URLs or hostnames. Datamining Google's search index is useful for many applications. Despite this, Google makes it difficult for researchers to perform automatic search queries. The aim of GGGooglescan is to make automated searches possible by avoiding the search activity that is detected as bot behavior. This Metasploit module exploits a vulnerability found in ICONICS WebHMI's ActiveX control. By supplying a long string of data to the 'SetActiveXGUID' parameter, GenVersion.dll fails to do any proper bounds checking before this input is copied onto the stack, which causes a buffer overflow, and results arbitrary code execution under the context of the user. This Metasploit module exploits a vulnerability in SPlayer versions 3.7 and below. When SPlayer requests the URL of a media file (video or audio), it is possible to gain arbitrary remote code execution due to a buffer overflow caused by an exceeding length of data as the 'Content-Type' parameter. Site By CRiSH code suffers from a remote file disclosure vulnerability. Apache Struts 2 framework before version 2.2.3 is vulnerable to reflected cross site scripting attacks when default XWork generated error messages are displayed. HP Security Bulletin HPSBGN02680 SSRT100361 - Potential security vulnerabilities have been identified with HP Intelligent Management Center (IMC). The vulnerabilities could be exploited to allow remote execution of arbitrary code. Revision 1 of this advisory. backtrack 5 does not come with postgresql out-of-the box (? ), but this is easily fixed. right off the bat I want to thank sickness for his excellent tutorial => Metasploit db_autopwn using PostgreSQL which I used to get metasploit up and running and quote a couple commands here (verbatim). he is the person who should be thanked here, I only tweaked things a little to work with BT5. note that there is no need to edit the /etc/postgresql/8.4/main/postgresql.conf file to disable ssl, as the server works without trouble simply be installing postgresql from package. After much frustration I have gotten the GUI part of the backtrack 5 arm release working with the Motorola Xoom. Code: ls pentest It should echo back the folders in pentest, stuff like 'backdoors','database',etc. vpnpasswd When you type in 'vpnpasswd' this is to the the password for the tightvncserver. Since I only connect locally I just use 'qwerty' for my password, and then confirm the password. When it asks if you want to create a view only password just type 'n' and hit enter. After you have your password setup for vnc start the server up. Code: tightvncserver -geometry 1280x800 When this happens you will get a message confirming that "New 'X' Desktop is localhost:1" and a bunch of other random stuff below it (it isn't important unless there are errors listed). At this point, press the "HOME" button on the Xoom and then open the application "androidVNC". In the "Nickname" box, you can name it whatever you like. In the "password" entry, use your password (mine is 'qwerty'). In the "Address" box you can type in localhost (or leave it blank). ****Change the port from 5900 to 5901. I also recommend setting the color-depth to 24-bit. After that press the "connect" button, and bam! 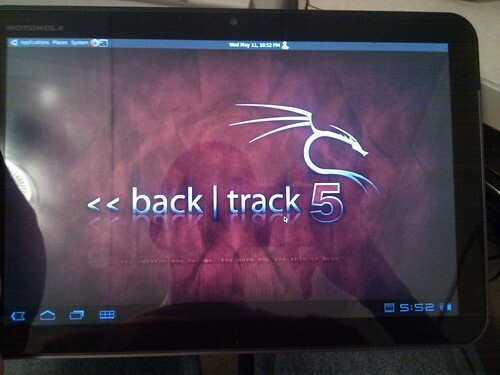 You're rocking Backtrack 5 on your motorola xoom!! You're welcome to repost this on other message boards of on your website, please just give me credit though. Thank you and enjoy! I couldn't post this in the How-To section. I think it's because my account has next to no posts at all! I was very happy to install BT5 but I have a question ? if i try to add ubutu repositories to the /etc/apt/sources.list and then upgrade , what will be the effects to my BT5 ? Jenbo just posted this but since I wrote it up already and he left out a few steps excuse the double. "Developer Drivers for Linux (270.40)" and "CUDA Toolkit for Ubuntu Linux 10.10"
Code: ./devdriver_4.0_linux_64_270.40.run --kernel-source-path /usr/src/linux-headers-2.6.38 Then do the toolkit "no need for headers .. enjoy the matrix :cool:"
Before you boot back into X you need to delete the same 4 files from the top! I was very happy to install BT5 but I'm having a network problem which reminds me of my Lucid install. /etc/init.d/networking start throws up a complaint about using 'start' which is fair enough because I remember problems with Lucid last year and the fix was relatively simple. The above procedure does not work with BT5 of course because /var/lib/NetworkManager/ does not exist. ifconfig will put eth0 up but a connection will not be established. WICD will 'see' the network but will be unable to make a connection. It's the first time since the mid 1990's that a simple ethernet connection has failed. I'm sure there is something obvious I'm missing and I apologise in advance but without networking the operating system is useless. I'm on a Vaio P by the way, which is a pain as regards poulsbo, but networking has never been a problem. If anybody has any ideas it would be appreciated. I have been having issues getting my internal wireless card working. I know the wireless card works with Ubuntu 10.04 by testing with the live CD, so I waited for the upgrade until I asked for help. Well...I'm running BT5 now, and the wireless driver is still not loading. I'm running BT on an IBM R52 with an Intel 2915ABG wireless card. first install the nvidia driver from the nvidia site. and thats it you should be done ! Don't know why thy didn't include pyrit in BT5 as it was awesome ! Seems like BT5 really really hates me. After spending 4 hours on isolinux and finding out that I just have to hit Enter ( I know, I know...), I ran into another problem. ddxSigGiveUp: Closing log DVD's md5 checked and it is correct. I was having some difficulties getting BT5 64-bit KDE to install in VirtualBox and after hunting around on this forum I figured it out, so I thought I'd share. rm /root/.kde/cache-root/plasma_theme_Volatile.kcache This fix was previously pointed out here by fnord0 (and many thanks to him). After KDE boots, you can run the install script on the desktop without incident. cp -rf include/generated/* include/linux/ This was originally posted here by muts (and again, much thanks). After the kernel sources have been prepared, the VBoxLinuxAdditions script will run without incident. After all of that, BT5 should be good to go. In the event startx fails again, simply repeat those 4 'rm' commands in step 2.
potentially not much difference with an appliance. PRAEDA: A Automated Printer Data Harvesting Tool!!! Exciting times! I wish to stay awake all night long and know whats going on at ShmooCon! Unfortunately, I havent been there evar! Anyways, about Praeda, it helps you to leverage Multifunction Printers during penetration tests and gain access to other core network systems! It is a known fact that most printers are left unsecured in an organization with default passwords and sometimes the network interface is open to the internet! This is evident from several of our Shodan Queries and Google Dorks. Incidentally, Praeda means to plunder, spoils of war, booty taken in a war (penetration test in our case!). By taking advantage of poor printer security and vulnerabilities during penetration testing we are able to harvest a wealth of information from MFP devices including user-names, email addresses, user address books, authentication information including SMB, Email, LDAP passwords, etc. Sometimes, they could also aid you in remote retrieval of prints, faxes, scan copies! Certain printer installations could also allow you to access the HTTP interface, and make a configuration copy! This could allow you to further see the internals! In short, PRAEDA is designed to automate some of the information gathering from network appliances through web-management interfaces such as printers and network appliances. This open source tool is programmed in Perl and has several modules that focus on almost 28 devices in all! The module to be used is enumerated from the different models of printers using Title page and Server type responses from the printer management page. All of the results will create a folder called project1 and save all information in that folder. Also will create a log file called data-file.log to hold information. I think this new BT5 was a waste of bandwidth to download. Both the 32 and 64 bit KDE versions will only make it to the GUI through debug mode, and then I get to stare at a desktop while my common Logitech keyboard/mouse combo, that did function in BT4, just don't work. The fact that only debug mode gets me into a GUI shows a complete lack of proper testing. I'm already seeing a load of fixes posted to overcome multiple issues. Sadly, without any input device function, all the fixes in the world are useless. Backtrack 4 was great...this one...pitiful example of a Linux release. Exim could be made to run arbitrary code under some conditions. Am testing GT5-G-32bit in vmware. Default settings other than 3200MB memory. The installer works fine up until 99% (possibly when it needs to install grub). Memory usage is almost maxed out. Install ISO and VMdrive on fast Raid0. Tech Gyan - First ever public disclosure of Password secrets of "Apple Safari". Mom&apos;s Guide - User Agent on my Header. the issue is dedicated to Browser security. someone got pissed off at a technical discussion on FD while other crap goes un-noticed. attacker to compromise web user security. This should really go without saying but after seeing a couple of posts already on the topic, it seems it might need a bit of discussion. the only difference is one uses Gnome as the window manager and the other uses KDE. Users also have the choice to use fluxbox. Please do not make any other posts asking what the differences between the versions are! Each time i try to run msfconsole the process gets killed automatically. Why is this? NOTE: BEFORE YOU PROCEED PLEASE CLOSE FIREFOX COMPLETELY! root@evilbox: mv -f libflashplayer.so ~/.mozilla/plugins/ Start Firefox and enjoy! I want to thank corelanc0d3r for helping me test this! Hello , Firstly Backtrack 5 is amazing. i downloaded the gnome 32bit version. When i installed it on my hardisk i am getting this Errorr. Currently I am dual booting backtrack and Windows XP. I tried to google it but i am not a able to solve it yet. call stack error with both metasploit drivers. I am having a hell of a time concerning issues with metasploit on BT5. I recieve call stack errors when trying to create databases with both drivers mysql and postgresql. below is metasploit's output. If someone could help me out, I'd appreciate it. Also, off-topic but what are the commands to install sqlite? 888 888 888Y8b. Y88b. 888 888 X88888 d88P888Y88..88P888Y88b. SkipFish 185b to 1.88b ! As you can see, package don't have "skipfish.wl" file ! After usual install to make this file we need to run this command : cp dictionaries/default.wl skipfish.wl. On BT 5, this don't help, you need to make manualy this file, but that is not good solution, developers words. Update from 1.85b to 1.88b. I'M installed The BT5 on my hard disk,now i want to install NVIDIA driver. Unable to find the kernel source tree for the currently running kernel. Please make sure you have installed the kernel source files for your kernel and that they are properly configured; on Red Hat Linux systems, for example, be sure you have the 'kernel-source' or 'kernel-devel' RPM installed. If you know the correct kernel source files are installed, you may specify the kernel source path with the '--kernel-source-path' command line option. my notebooke is ASUS A53XI241SV there are two Graphics.Intel and NVIDIA GT540M. I agree, but the rate of disclosure is much less than for windows or linux OS. and they outmatch most of x64 servers. Do you mean they lie? I don&apos;t mean to defend them, I really don&apos;t care, but can you develop? That&apos;s the dread secret - they aren&apos;t really &apos;monsters&apos;. Sure - but that has nothing to do with the &apos;sanity checks&apos; and &apos;inspectors&apos;, which are custom-coded. BadAss is a Ruby script that makes it very easy to perform cracking attacks, port scanning, and more. firewalls by units shipped, contradicts this statement. ones; and there&apos;s no correlation at all between the size of a network and the complexity of network access policies. I am trying my hand at programming, and have have used some cryptography algorithms to generate a license key of sorts for my program. Basically, if you saw this key would you be able to crack it/have ideas about what algorithms have been used etc? Unsure if this has got anything to do with my nvidia driver issues on both 32/64bit Gnome. linux-source is already the newest version. Try `cp --help' for more information. I'm running BT5 KDE 64 bit installed to HD. I'm trying to install the vmware player on my backtrack machine. At first everyting goes fine untill I get an error that says that vmware can't locate the kernal headers. It says they are probably not installed in the default directory and it asks me for a path to the headers. Is there anyone who knows where they are installed or are they not installed by default ? no place to change the default size and I tried the System/preference/preferred applications/system/terminal emulator/ custom as gnome-terminal --geometry=160x50 but it doesn't work. Not for the icon but for all the tools that start a terminal. Package Manager...where are all the packages? There were LOTS of tools that I used in BT4 that are no longer 'stock' in BT5. I tried to use the new package manager (KPackageKit) and nothing comes up. Are the repo's down or am I doing it wrong? I really don't want to have to apt-get for each tool I used. I did install the Synaptic Package Manager but it seems that re repo's changed and most of the tools that were on there are gone. Anyone have an idea to how to get some of the old repo's? Thanks this useful sum-up for the discussion. I have problem with installing BT5 via DVD. Everytime I want to boot BT from DVD, ISOLINUX pops up (2 lines, first is about tool and its author, second starts with "boot: " and expects input from me). I don't have any experience working with that tool /shell / whatever it is. Any unix-like command I can remember fails. I downloaded .iso and checked md5. It matches with one provided in torrent folder. I burned it on lowest speed (1x) with two different burners (XPBurner and Active ISO Burner) 3 times - none of DVD is working how it should (starts ISOLINUX). I checked md5 of burned files. Everything seems ok. I went through few tutorials how to burn .iso file step-by-step (just to mention, this was heavly overkill, I'm not rocky with Linux or .iso files). I found my old BT4 r2 DVD and it seems to boot nicely. I know I'm doing mistake somewhere, I just don't know where. And it's really frustrating. I feel like Goliath being constantly slapped by David. free to keep it public. What wireless adapter should I buy? Guys, can you tell me does my wireless adapter should have something special in order to crack wpa keys using aircrack, or any adapter would just work fine? I'm asking this question because I'm going to by it soon. So just tell me what should I buy? I was wondering how do we browse Backtrack 4 r2 old forums. Tried installing to an 8 gig san disk cruzer USb thumb drive using the unetbooting method and the grub-install method as indicated by the wiki. With both installs, when i attempt to boot into the usb key, i get dropped into a busybox shell and i notice an error "Alert! does not exist. Dropping to a shell". It does not say what does not exist and im stuck here. Anyone encountered this before? So , my question is : how can u execute .sh files located in the dextop from terminal ?? sorry for my noob question and bad english !!! EDIT: i just found out that i should place the .sh file in the home folder to execute it with terminal , but what should i do if i want to execute a .sh file located on desktop ?? Congrats on a superb release guys. Just thought id report this in the HCL section. I have a RTL8192E wireless card and it is being reported by airmon-ng as having a RTL8187 chipset (which it doesnt) and driver in use is r8187, this is obviously wrong because i used this card in BT4 r2 no probs. Just to let you know the issue is there, cheers. Can Iimport my .Leo files in 'Keepnote'?? Backtrack 5 hangs at poweroff ?? I tested on both the KDE 32 bit and the 64 bit version and when I Try to shut down from the terminal by typing "poweroff" Backtrack 5 seems to hang. I can only see the backtrack wallpaper. So I don't see any error messages. I waited like half an hour but it doens't react. Anyone else experiencing this problem ? The Digital Forensics Framework (DFF) is both a digital investigation tool and a development platform. The framework is used by system administrators, law enforcement examinors, digital forensics researchers and students, and security professionals world-wide. Written in Python and C++, it exclusively uses Open Source technologies. DFF combines an intuitive user interface with a modular and cross-platform architecture. Released FTPCommander Password Decryptor ! FTPCommander, FTPCommander Pro & FTPCommander Deluxe. on a netbook (Samsung N110) and am loving it ! Damn it looks awesome... !! Fantastic job on the GUI, it feels.. well.. really professional ! and just simply looks awesome. however crunch v3.0 will probably be requested to be included within short I'm sure. Just a couple of queries on the basics..
case with the Gnome VMware version. Can anyone please give some pointers on that ? Noted that ksnapshot is not included, no biggie as easily installed. However wondeinrg if an alternative was included that I may have missed ? for me on the Gnome install on VM returning an error. X Error: BadMatch (invalid parameter attributes) Whereas the exact same command works fine on the HDD KDE install on netbook. Am I missing something trivial ? All in all though, very happy with yet another superb release. If you say so, then it must be true.